For 20 years, Dr. Bill Thomas, a Harvard-trained geriatrician, has worked to improve the way nursing home care is delivered. He has encouraged caregivers to treat “residents” as people who need care, not just patients who need treatment. Today, about 300 long-term care centers across the country have adopted his “Eden Alternative” concept – to bring pets, children and plants into facilities to alleviate loneliness and boredom. Another 250 “Green Houses” incorporate his ideas into new construction, built for no more than 10 people, with kitchens and living rooms at the center, instead of nursing stations. But change hasn’t come fast enough. So he tried a drastic approach. He decided to use theater and become a performer. 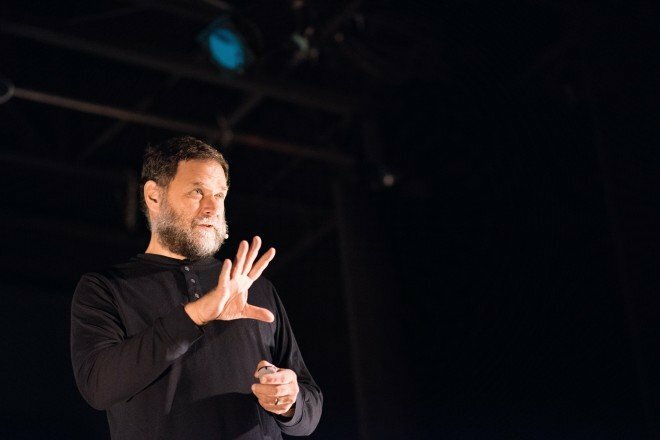 He created “The Age of Disruption” – a 30-city tour that includes his one-act, 80-minute “non-fiction theater” performance, “Aging: Life’s Most Dangerous Game” – to inspire people to “disrupt” the way they think about aging.